As we near tasseling, the question of whether to spray foliar fungicides on corn becomes a hot topic. Recommendations are based on your particular operation and take in to account several factors: 1) Do you have symptoms of foliar fungal disease? 2) What is the level of susceptibility in your hybrid?, 3) Do you have a history of foliar fungal disease in your field?, 4) Did you plant corn last year?, 5) Does corn residue cover your soil?, 6) Is warm, humid weather predicted for July and August? Disease symptoms. Common foliar diseases of corn in Illinois are Anthracnose leaf blight, Gray leaf spot and Northern leaf blight. Secondary infections can occur with both Gray leaf spot and Northern leaf blight. 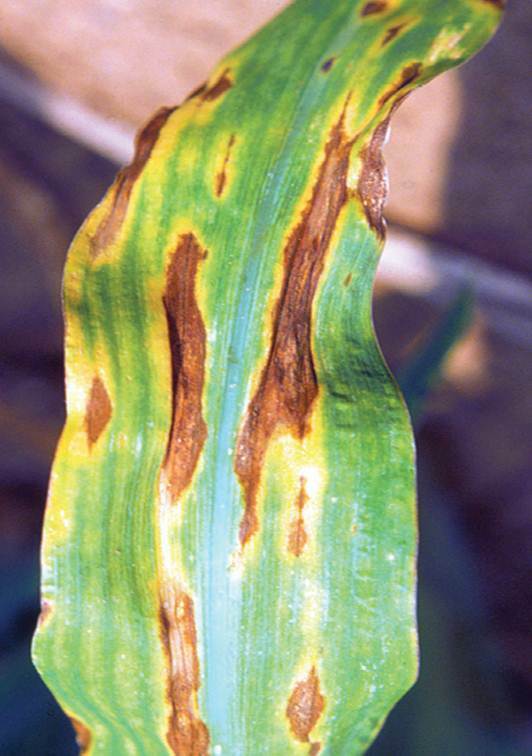 Lesions of Anthracnose leaf blight are brown to tan in color, oval to spindle shaped and have a distinct orange to yellow 'halo' (Figure). Signs of the fungus, small, black spines called setae, can be observed in mature lesions with a hand lens and can help in diagnosis. 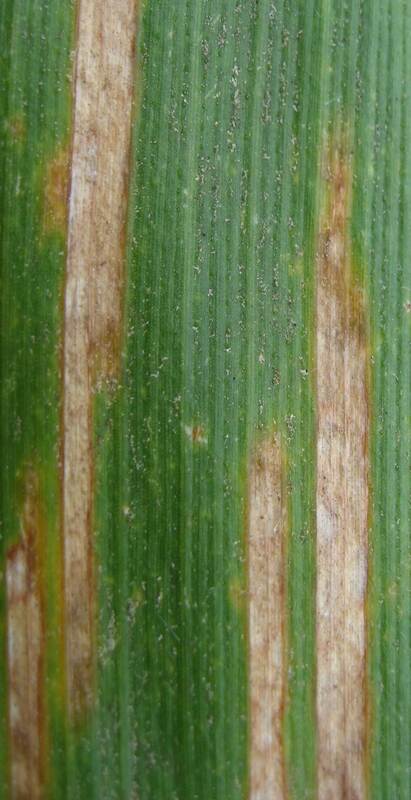 Lesions of Gray leaf spot are rectangular in shape and start out tan to brown in color (Figure). Mature lesions become a silvery gray color. Lesions of Northern leaf blight tan to brown and are long and oval shaped with tapered ends (Figure). It is important to know what is ailing your corn. 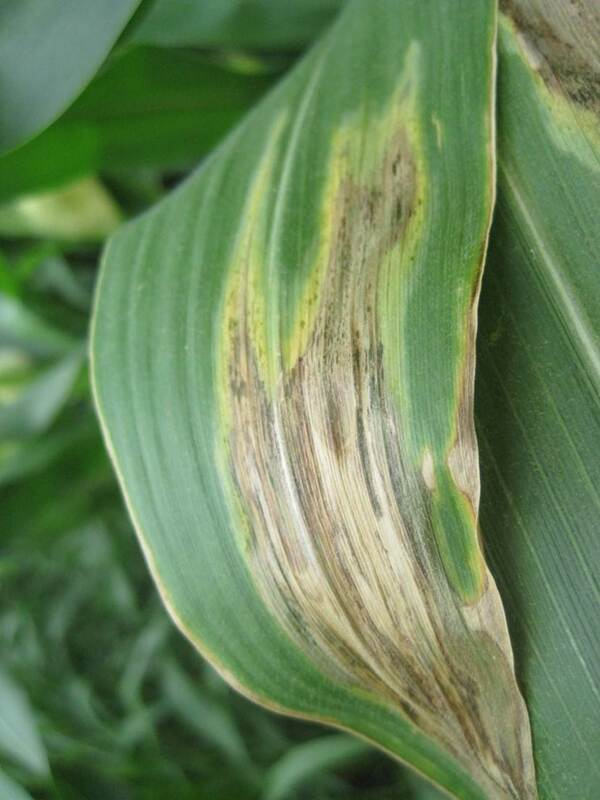 Although historically not as common as fungal diseases, Goss's wilt was confirmed in 31 Illinois counties in 2011 by the University of Illinois Plant Clinic. Foliar fungicides will not control Goss's wilt because it is caused by a bacterium. 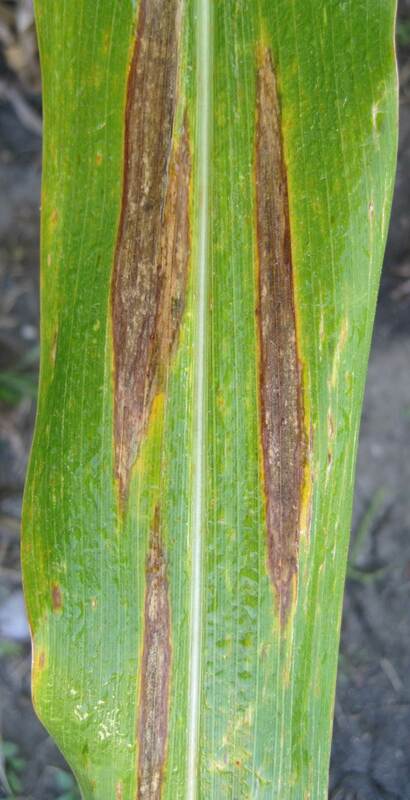 Symptoms of Goss's wilt are light tan, yellow to gray lesions with irregular, wavy margins. Lesions can also have shiny spots and small dark green to black flecks or freckles which can help in diagnosis (Figure). Scouting. Right before tasseling, scout your corn. Look for symptoms of fungal diseases on the third leaf below the ear or higher in the plant. I don't know about you, but every single field that I have seen so far this year has squeaky clean leaves (Figure). The hot, dry conditions that we have experienced for the majority of the growing season have not been conducive to disease development. Recommendations depend upon hybrid susceptibility. Fungicides are generally not recommended for moderately resistant and resistant hybrids. 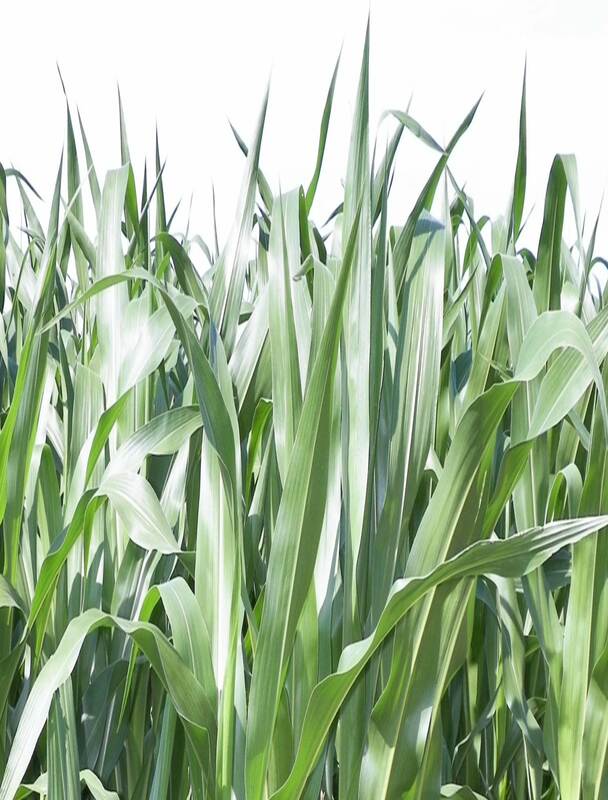 For susceptible or moderately susceptible hybrids, foliar fungicides should be considered when there are symptoms of disease on the third leaf below the ear or higher right before tasseling. This recommendation is supported by research by Dr. Carl Bradley of the University of Illinois. 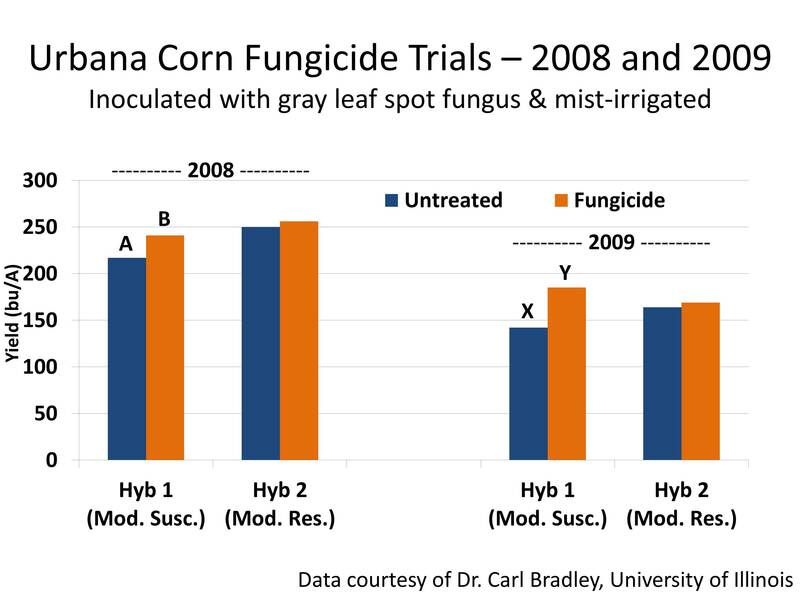 Dr. Bradley's group researched foliar fungicides in moderately resistant and moderately susceptible hybrids and found that in both 2008 and 2009, significant yield responses with fungicide applications were observed in the moderately susceptible hybrid but not in the moderately resistant hybrid (Figure). Recommendations are a little more complicated with hybrids of intermediate susceptibility. You should consider applying foliar fungicides if you 1) Have fungal disease symptoms on the third leaf below the ear or higher, AND 2) Planted corn last year, you have a history of disease and at least 35% of the soil covered with corn residue AND 3) Warm, humid weather is predicted for July and August. An in-depth article summarizing foliar fungicide recommendations by Dr. Gary Munkvold is available online. An article focusing on fungicide resistance in pathogen populations, fungicide rates, and fungicide recommendations for plant stress was recently written by Drs. Alison Robertson and Daren Mueller or Iowa State University.